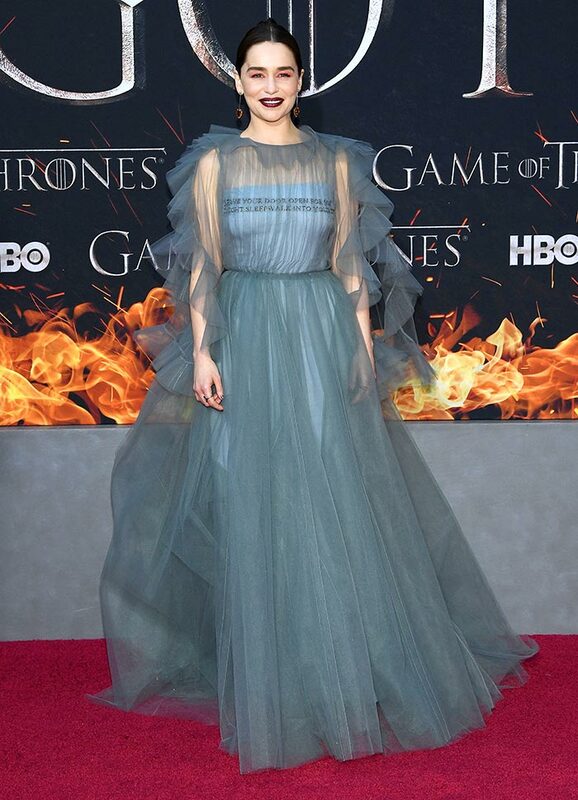 Stars of Game Of Thrones stepped out in their finest for the premiere of the popular series' finale season in New York. Scroll down for pictures from the star-studded event. Emilia Clarke known as Daenerys Targaryen (The Mother of Dragons) in GOT-verse aced the red carpet look in a Valentino gown. 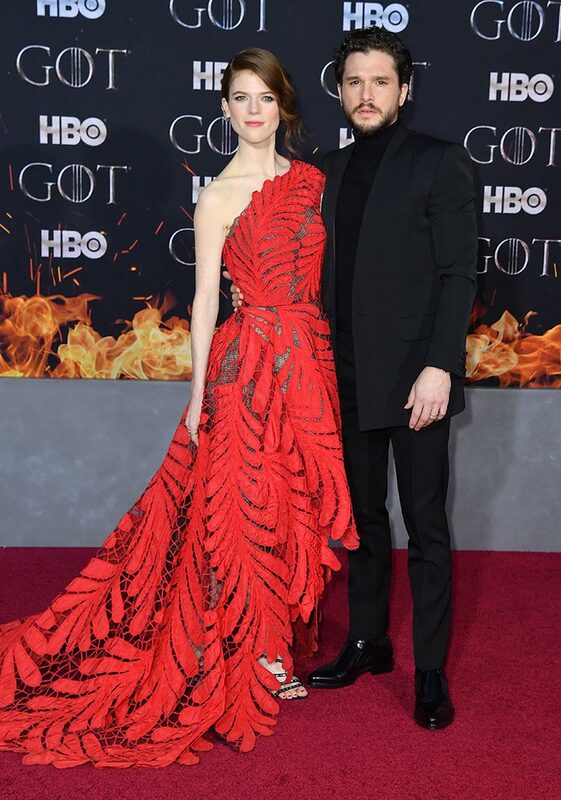 Actor Kit Harington, who plays the role of Jon Snow, arrived with his wife Rose Leslie, who played Ygritte (now deceased) in the show. Sophie Turner, who doubles as Sansa Stark on the show, checked in with her fiance Joe Jonas. Sophie wore Louis Vuitton. But sisters before misters - She posed with her onscreen sister Maisie Williams, who is better known as Arya Stark of Winterfell. Maisie wore a Miu Miu embellished outfit and added purple bangs for a quirky finish. Peter Dinklage, who plays Daenerys Targaryen's hand Tyrion Lannister, arrived with his wife Erica Schmidt. Nikolaj Coster-Waldau, also known as Jaime Lannister in the GOT universe, looked dapper. Isaac Hempstead-Wright, cast as Bran Stark in the series, was also there. Nathalie Emmanuel, who plays Daenerys' aide and confidante Missandei, looked stunning in Ermanno Scervino. Gwendoline Christie - Brienne of Tarth from the series - dazzled in Iris van Herpen gown. Natalie Dormer, who played the role of Margaery Tyrell, made a head-turning entry in a sleek Giorgio Armani gown. Actor Alfie Allen plays Theon Greyjoy in the series. Meet Jon Snow's bestie Samwell Tarly, played by actor Jonathan Bradley. Jacob Anderson, who plays Grey Worm (the commander of Daenerys' army), looked dashing. We hope to see actor Iain Glen - Jorah Mormont - again in the finale. Actor Jason Momoa, who played Khal Drogo, was also there. Actors Indira Varma and Pedro Pascal played onscreen couple Ellaria Sand and Oberyn Martell. Actor Hafbor Julius Bjornsson was cast as Gregor Clegane aka The Mountain. George RR Martin, creator of the Game Of Thrones universe.